Jammu and Kashmir state is situated in the great Himalayan mountains (mostly). 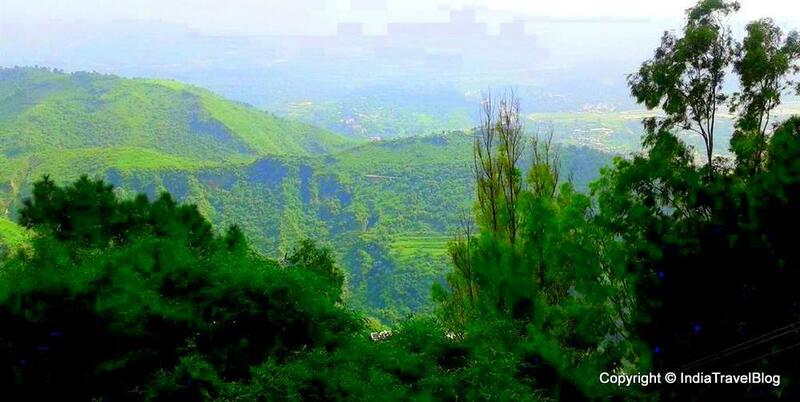 It is surrounded by Himachal Pradesh and Punjab in the South. 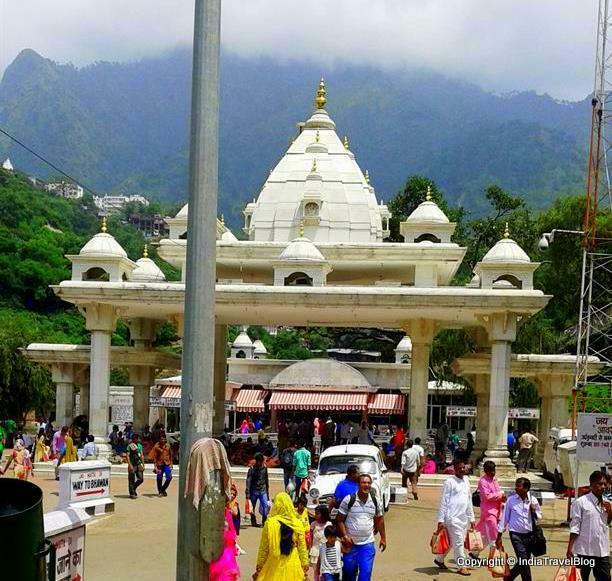 Here I want you to join me as I take you through our story of traveling to Mata Vaishno Devi Temple,Katra which is located in the Reasi district of Jammu and Kashmir. Jammu and Kashmir is a huge place to roam around with lot of attractions including Mata Vaishno Devi temple. Nature has nurtured the entire place very nicely. If you want to see and feel the nature's beauty then you must go to the place at least once. You can't stop yourself enjoying the nature's beauty and spending time at every step of yours there. Vaishno Devi temple is one of the most famous and most visited holy places in India. Two options of transportation are available to reach Katra. One is Through Railway transportation and the other is through the flight. The flight from Kolkata airport will take you off to the Jammu airport via Delhi airport. But the flight takes approx 10 hrs. Within this time, you'll be in Jammu. 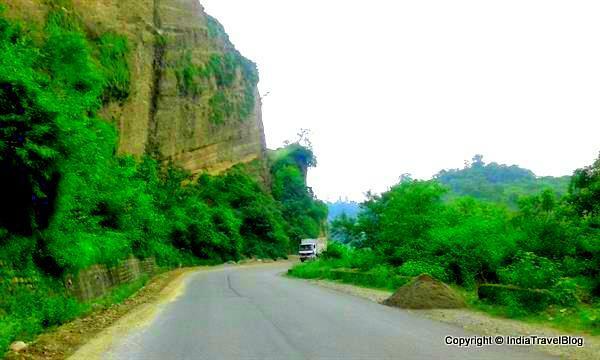 From there you can take Bus, Cab or Taxi to complete the journey between Jammu and Katra. One of the trains that is available from Howrah junction to Jammu Tawi is the 'Himgiri Express'. Departure time is 23:45 on every Tuesday, Friday and Saturday. Arrival time to Jammu station of which is 12:10 hours. It takes approx 36 hours to reach. Katra is situated in the foothills of Trikuta mountains. After crossing the road the bus drives you through the hills. A beautiful scenario of mountains at one side and deep slope at the other side. Many homes are also there among hills. 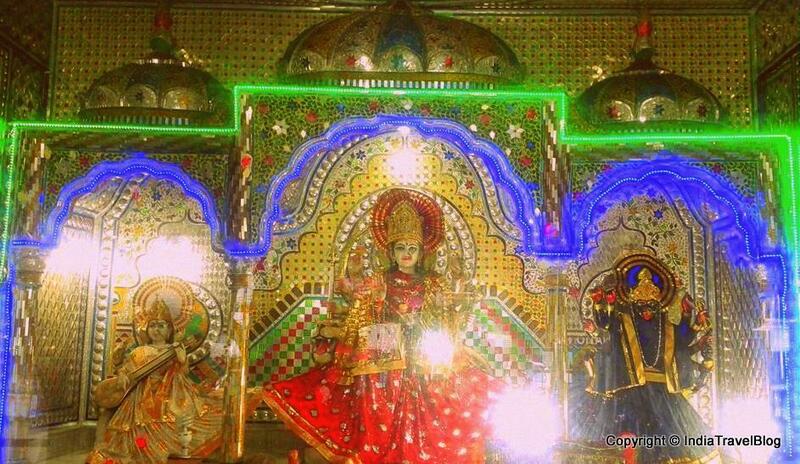 Temple of Mata Vaishno / Vaishnavi Devi is situated at the height of 2500 Feet (approx) of the Trikuta mountains. Jammu is the last city where you can reach by any transportation. There are no direct way to reach Katra. Reaching Katra you can start the trek immediately. Or book room in any of the available hotels there. Keep your luggage, get fresh, take rest for that night and start refreshed from the very next day. Any how, to start the trek you have to go to the Yatra Parchi Counter to register your name / your group. N.B. : The Parchi Counter remains open from 6 AM to 10 PM. So do not hurry to arrange the Yatra Parchi, because once the Parchi is registered you and the group has to cross the Ban Ganga Check post within 6 hours. You can start your trek any time in 24 hours of 7 days. There are no restrictions. So you should arrange your Parchi according to your trek. After you get the Yatra parchi be very careful to keep it safe along with you. It'll be needed very frequently. You may complete the distance to reach temple walking by foot, riding on a horse i.e Pony, Palanquinsor helicopter. The helicopter will drop you close to the Vaishno Devi Shrine. If you don't want to book a hotel room you can simply avail cloak room facility where you can put all your extra luggage except money, jewellery, gadgets, i-phones etc. No need to carry food because they are available in plenty on the way or route. And yes you can also avail blankets free of cost but at some distant, like Adi Kuwari, Sanjhi Chhat and Bhawan. Though there are plenty of lights on the trekking route, and one need not to worry about the darkness, but it is my sole advice that still you should carry at least one small torch in your pocket which can be useful in time. Actually, when start getting down the mountain you'll get two way. That time the torch can prove to be useful. 90% of the people prefer the kind of trekking is by own foot. It is said that it takes about 30-35 hours to complete the whole trekking comfortably, which means including Some rest, Darshan time, some sleep as well. We also selected this kind of trekking. We took some rest on the way but did not sleep. It took about 18 hours in total to complete the trek. By then we were in the Hotel we booked and kept our luggage. You can drive your own vehicle up to the main entrance of the Trikuta mountains, Darshan Deodhi, only, and then park the car in the parking area which will be solely your responsibility and risk. Auto-rickshaws are also available from Katra to Darshan Deodhi. Costs Rs.7-10 per person for 2 km's distance. Or avail helicopter from Katra to Sanjhichhat. Costs Rs. 900-1200 person. Time can be saved a lot. But you won't be able to see Adi Kuwari, and the journey will be of single side only. Distance is about 2.5 km's. You can increase the distance if wish to visit Bhairon Temple. You can select to sit on the back of Pony to complete your trekking. They are good for the kids and older person. Depending on the weight of a person the rate may vary between Rs. 300-600 per person. You can also book Palanquins from Darshan Deodhi to Adi Kuwari and then Bhawan to Bhairon Temple. Depending on the weight of the person, it may cost you Rs. 2200-4000 for the whole journey including back to Katra. N.B. : From this point no video cameras are allowed. There at Darshan Deodhi you'll find security check post where you have to make separate queue for ladies and gents. For any luggage, you have to make another queue. They will check you in order and manually. They will also check if you are carrying any cigarette with you as it is a holy place and such things are strictly restricted. Luggage has to be passed through X-ray scanners. Some other options are also available for you to carry your luggage or small child etc, just after crossing the security post. Next, you have to wait at Ban Ganga check post as your Yatra Parchi will be stamped by an official personnel which conveys that your 6hrs validity is over to cross the Ban Ganga check post. So, try your best to reach the check post within 6 hours time after you entered in Katra with Yatra Parch. The name of Ban-Ganga river has an ancient and famous story behind. 'Ban' means 'Arrow' and 'Ganga' is the name of a holy river. After crossing the check post you'll come to a small bridge on the Ban-Ganga river. You'll find stairs there leading to the river. This place is very calm and refreshing air makes you feel awesome. The water here is very refreshing cold. Many people take bath here. 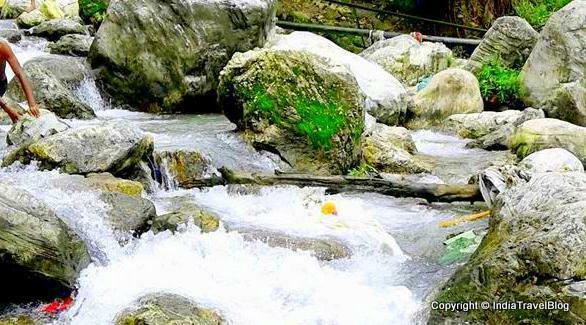 A small waterfall of Ban-Ganga is seen after walking about 20 minutes from the river. It also has a story. Many people take bath here also. 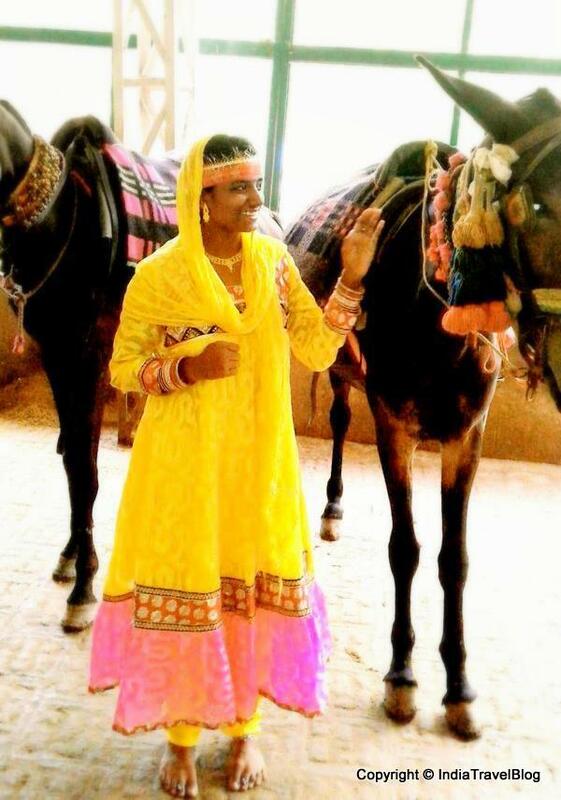 The story says that when Bhairo was chasing Mata Vaishno, at some place she stopped and looked behind for a while whether Bhairon was still following her. On that place she left her foot prints. This is the place where we do the first darshan of Mata Vaishno. It is a beautiful well-constructed temple. This temple is, that is why, renowned as 'Charan Paduka Temple'. The next temple that you will see on the trek of the holy shrine is 'Adi Kuwari Temple'. 'Adi Kuwari' or 'Adh Kuwari' means 'The Eternal Virgin'. To get into the 'Garbha Joon' you, first, have to go to the sequence counter and get sequence number. And to get that you have to show them your Original Yatra Parchi at the counter. Sometimes it takes a lot of time for your sequence number's turn to come. We, instead of waiting, after getting the sequence number, completed the rest of the trek and came back to 'Adhkuwari' again, till then also our turn sequence number was behind about 20-30 numbers. I had keen desire to get into the cave. It was over the midnight and my right leg got little injured. So we took the medicine facility there and came downhill. Inside of the cave, where she meditated according to the ancient legends, is as exact shape of a womb, unbelievable but true. 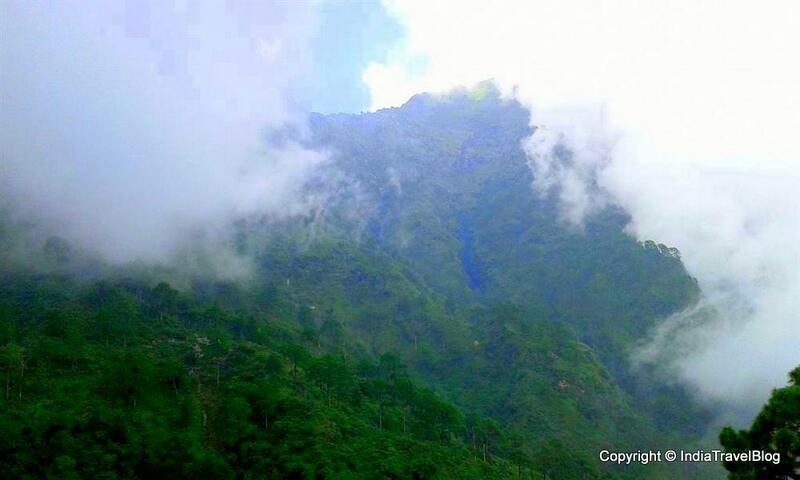 It is believed that Mata Vaishno went inside the cave to worship the god Shiva and resided there for 9 months. As a baby child lives in its mother's womb, mata Vaishno also lived in the cave. People call this place Garbha (means 'womb') Joon. As you will enter the Garbha Joon it becomes more narrow. You have to come out of the cave by crawling. Only one person can crawl at a time. It is believed that by passing through this cave, a devotee's soul becomes pious again. If you want to wait for some time there then go to the blanket counter, deposit Rs. 100 per blanket for security reason, and get them. Whenever you will return the blanket, you will get your money back. Breakfast, Lunch and Dinner are also available there. You don't have to go far in search of food for your family or group there at Adi kuwari Temple complex. Moving upwards the path will take you to the holy shrine of mata Vaishno Devi and Bhawan where you can do the Pindi darshan. Earlier you had to enter the temple in through cave. Now, they have made another way. People enter making a queue. At this place, you can't even take your purse along with you. You have to keep them at the security point. They will guide you. I had the desire to get in through the cave. And yes, here you have to submit the Prasads, Flowers, Chunni, Dalas etc. They said it was slippery and risky. So, we were not allowed to take the way. Anyways, I clicked a lot of beautiful clicks of nature.., lovely! Next, taking our purses and Prasad, we moved upwards to reach Bhairon temple. It is said to a devotee that, if s/he avoids moving to Bhairon temple and worship there, her/his worship to Mata Vaishno is not complete. All the efforts go in vain. After the Bhawan to Bhairon temple the slope has become very high, i.e. the steep trek makes the way risky and the road become narrow as you move upwards. Ponies are available here also. You can take stairs leading upwards to the temple also. I enjoyed the whole journey seeing natural beauty, rivers, temples, the crowd, Ponies, Palanquin, Monkeys and their romance on the mountain hill. Touching the clouds I felt I've come to the land of sky and clouds. The purity of nature attracted me so much that I can't explain in words! The night was amazing there. I was happy and sad both while coming back. Now, don't waste time and plan for the trip to Katra (Jammu), the Holy Place of Mata Vaishno Devi temple. Jai Mata Di. Have a nice day. Your blog helped a lot, Many thanks.. :) I have few queries, if you like to resolve..
You mentioned at darshan darwaja "N.B. : From this point no video cameras are allowed." but people share their trekking pics.. how come, any idea?